(15/P87) TRENTON – The Department of Environmental Protection’s Division of Fish and Wildlife will begin stocking rivers, lakes and streams across New Jersey with thousands of large two-year-old trout on Tuesday, October 13, providing anglers with opportunities for some great fall fishing, Commissioner Bob Martin announced today. After a scaled-back stocking in 2014, the full complement of 20,000 two-year old fish, averaging 14 to 22 inches in length, will be stocked in rivers, streams, lakes and ponds this fall. Because the majority of areas stocked in the fall also support trout released previously, these waters provide anglers ample opportunities to catch a bigger fish. 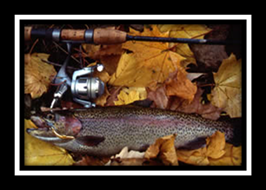 The Division of Fish and Wildlife will be stocking waters spread throughout all regions of the state with rainbow trout to provide convenient access for all to enjoy the sport. Waters stocked during the first week of the two-week fall stocking program are the 16 large streams and rivers in northern and coastal areas, including the Big Flatbrook, Pequest River, South Branch Raritan River, Musconetcong River, Manasquan River, and Toms River. During the second week, 15 ponds and lakes in the central and southern portions of the state will be stocked. All fall-stocked waters may be fished as soon as they are stocked; there are no “closed waters” during fall stocking. There is a 9-inch minimum size limit on trout in New Jersey, so anglers must immediately release fish smaller than the minimum size. Other waters offer fine trout fishing opportunities even though they are not stocked in the fall. 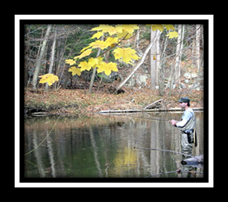 The Holdover Trout Lakes, such as Lake Aeroflex in Sussex County’s Kittatinny Valley State Park and Lake Wawayanda in Passaic County’s Wawayanda State Park, provide year-round trout fishing opportunities. Those waters, along with Tilcon Lake in Allamuchy Mountain State Park, are included in the landlocked salmon stocking program, now in its ninth year. All three yield harvestable size salmon (minimum 12 inches). The complete list of fall-stocked waters and the stocking schedule is available at http://www.njfishandwildlife.com/flstk15.htm or through the Trout Stocking Hotline at (609) 633-6765.